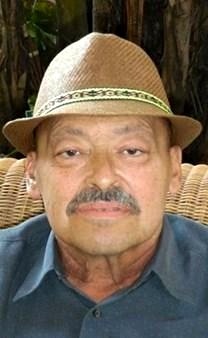 Harry Rodriguez, 64, of Olathe, KS died Thursday, May 14th, 2015 at 5:44pm at Olathe Medical Center after a battle with cancer that he fought until the very end. His strength and determination remained strong throughout his entire illness. Harry is survived by his wife Beverly, his sons Daniel, Steven, and Joseph; their wives Maryann, Sondra, and Isabel; his brother Ed; his sisters Betsy and Evelyn; and he was blessed with 9 grandchildren Zach, Andrew, Abigail, Eddie, Alex, Lucas, Isabelle, Avery, and Grayson. Harry is preceded in death by his parents Amado and Eufemia Rodriguez and his sister Madeline. Harry was born in Ponce, Puerto Rico and moved to Chicago, IL as a young boy. At the age of 15 he fell in love with the girl next door, Beverly, and later married her in 1970. Throughout his life he was in the United States Air Force, worked for Griffin Wheel, and was currently working for the Olathe School District. Harry lived a fulfilling life and touched the heart of many that he met. His legacy will live on through the lives of his children and grandchildren, who brought so much joy and happiness to his life.